I am always happy to have the chance to tattoo the belly, and I must thank all the tribal dancers of the Samadhi Dance troupe for supporting the art of henna tattoo here in Jacksonville, Florida! 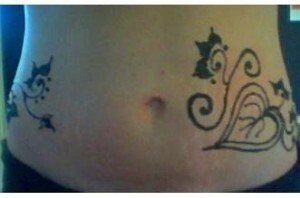 Today I am posting pics of a wrap around belly tattoo. The first image is the "tease" front of the design. 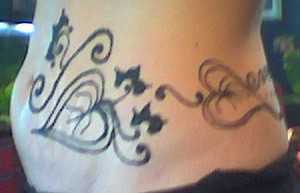 The tattoo actually began with an open lotus blossom on the lower back (scroll down). The dancer knew she wanted that. The challenge then became to create a wrap around pattern that would be bold, visible at a distance, and compatible with the lotus. 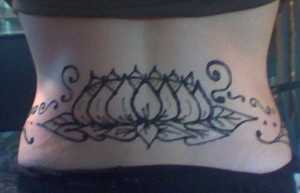 As you can see, the leaf pattern under the lotus was expanded and wrapped around to "vine" onto the belly. Hopefully I will be able to upload a picture of the finished color sometime soon. 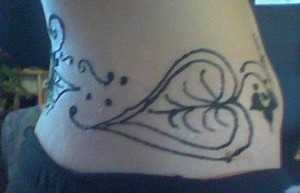 The next posts should be of test results for various henna suppliers who have sent samples to the Studio. I am always looking for great henna powder, and to date.. the best sample tested for easy of use, great texture & good color is the Jamila powder. Test results are on the blog!